Ukulele Lessons in Southampton provided by Gary Blackman. Free taster lessons to all new students, call now on 023 8065 8373! 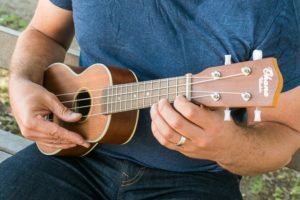 Gary Blackman connects well with students within a wide range of ages and abilities, building confidence and enjoyment in the ukulele. He is extremely passionate about music and has the ability to communicate this to others, inspiring them to learn more. Gary has had an extensive career in the music industry, spanning thirty two years and crossing performance and teaching aspects of the industry. He played Bass guitar as part of 80’s star Yazz backing band, as well as for Davey Jones from The Monkees and jazz legend Andy Sheppard. He also appeared with Gary Barnacle of Level 42/Paul McCartney and supported ska band giants Bad Manners. We also offer guitar lessons for beginners, piano lessons and clarinet lessons in Southampton.